I love you - This is the affectionate sentence we talk to her. Thanks to her Daddy for teaching this wonderful words to her and that makes wonder on ourselves everyday. I always wanted to build warm and close attachments with my daughter and of course that is the basis for every relationship. Even though I go for work, I always make sure that she does not miss me. In turn our sweet pie returns with her unconditional love always.I cherish every cuddling moment with her and when she tells that three words with the extra long hugs and tight kisses, I feel a divine vibration. I swear! Our bed time is always wonderful except few times when she is cranky! Otherwise we like to talk, like to tell Kakka stories or we simply fight for catching my hair! :-( She is habituated for holding my hair when she sleeps, when she cries and sometimes when she got bored with her toys. Yeah, It is really irritating me sometimes, but I could not find anyways to solve this. Sometimes If I act like crying and saying that I want that and this, she comes close to me by clapping her hands, hugs, pat me on her shoulders and tells "Amma, mudi pidchiko, Azhathe!". And sometimes she likes to sing lullaby also for me and Though she gives me a choice of two, I can not choose the other, she likes to sing whichever she is comfortable with. And whenever we say something like, oh! I have headache or my leg is paining, she will come and massage. 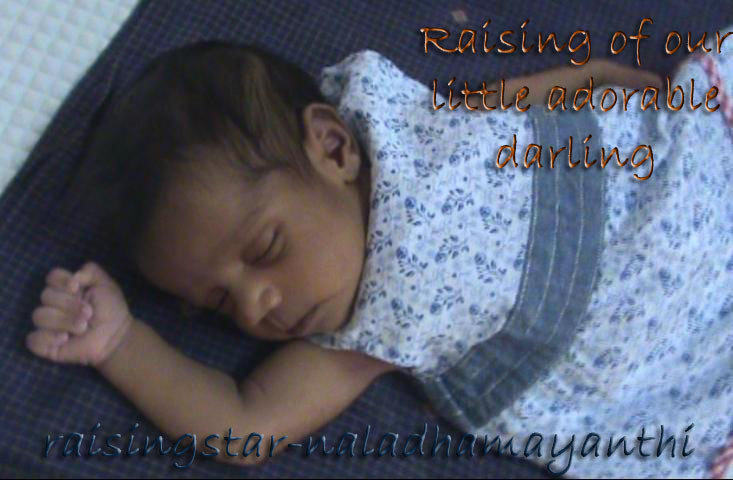 And the ultimate thing is, she will say, "Appa thungunga, thungina sariya poidum". Yeah, she repeats what we tell her! Paasakkari!